The complex of apartments Villa Penny is situated in a beautiful location in the enchanting place Lemonakia in the area of Kokkari on Samos island - Greece. It is a new building, which operates since 2005 as three keys category apartments. The building is simple and impressive with its discreet elegance. The stone decor combined with earthy colors create a beautiful and intimate environment that pleases the visitor. 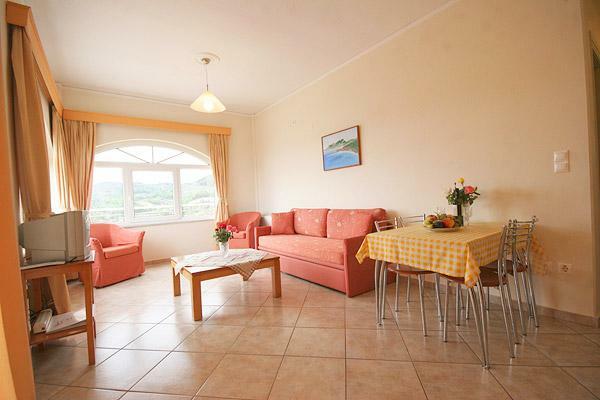 All areas of Villa Penny are spacious and easy to use. They are tastefully decorated and luxuriously furnished. While the services offered are of high quality and meet the requirements of all visitors. This fact is evidenced by the excellent impressions and reviews of our customers, published on the Internet. They not only recommend Villa Penny to their friends, but they return themselves. The «Villa Penny» is named after the daughter of the owners Dimitris and Metaxia Manoliadis. Είστε ιδιοκτήτης ή διευθυντής στο VILLA PENNY; Εγγραφείτε τώρα για δωρεάν εργαλεία, που μπορείτε να χρησιμοποιήσετε για να βελτιώσετε την καταχώρησή σας και να συνδέσετε την ιστοσελίδα σας και το σύστημα κρατήσεών σας.